I love spinach. In almost any form, in [almost] any dish. So when I was researching the other day WHAT to do with the half-container of orzo that made the move with us, and found this recipe--ding ding ding! this recipe not only sounded perfect for summer, but contains the blessed SPINACH. I made this for a get-together the other night with orzo, and it was wonderful. Our neighborhood Kroger did not carry orzo, and being in a hurry, I picked up this Arborio Rice instead (risotto practically...right?). A word on pine nuts: yes, they aren't the cheapest nut on the block. But boy howdy, are they a good complement to this dish. Don't skimp. The small package was on sale at Kroger. Pour half the container of Arborio rice into boiling salted water and cook for 20 minutes, al dente (orzo takes about 10 minutes). Then you drain and rinse with cool water. Top the spinach with the warm risotto and stir, which will cook/wilt the spinach a little. Then top with the fixins: feta and pine nuts. Bring a large pot of lightly salted water to a boil. Add orzo and cook for 8 to 10 minutes or until al dente [risotto takes 20 minutes]; drain and rinse with cold water. Transfer to a large bowl and stir in spinach, feta, onion, pine nuts, basil and white pepper. Toss with olive oil and balsamic vinegar. Refrigerate and serve cold. 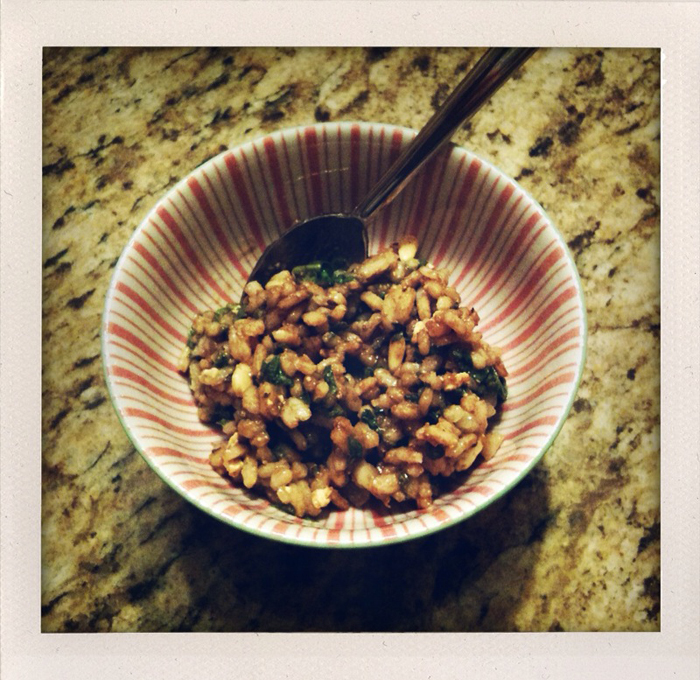 A word on orzo vs. risotto: the risotto is heartier. sometimes I like that. you know? Depends on what's available/what you're in the mood for. *Another note: I think I prefer the risotto version lukewarm/warm, not chilled. Orzo is better chilled/lukewarm. Food is what makes summer a little more bearable. And the fact that Eclipse comes out soon. that looks extremely delicious. will have to try it!